If you need a form that can do much more than just a contact form then you need to be using plugins like Formidable Pro or Gravity Forms. Let me review the formidable pro plugin to help you judge what kind of forms can be created with formidable pro. WordPress plugins like Contact Form 7 or Official WordPress Contact Form bundled inside Jetpack provides what is needed for a contact form on your WordPress blog but if you need a custom form that can do much more than just serve the purpose of your contact page then you need to be using plugins like Formidable Pro or Gravity Forms. Let me review the formidable pro plugin to help you judge what kind of forms can be created with formidable pro. User registration system that allows users to register with many custom fields and details with formidable registration module. Questionnaire forms similar to surveys. 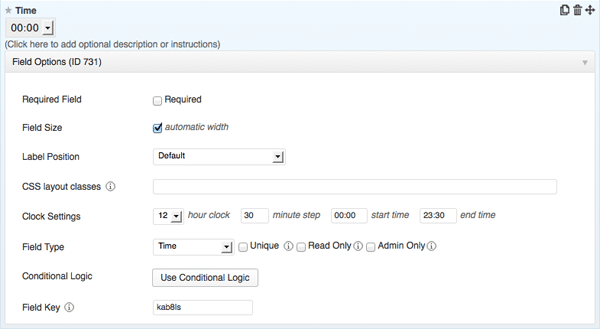 Allow users to create WordPress posts that act as a question and admin can answer those questions and publish the posts. Apply for a job in a company site using formidable. Paid registration system using PayPal payment gateway. What I Like About Formidable Pro? Formidable and Formidable Pro (Aff Link) both allows you to have an easy to use easy drag drop interface for creating forms unlike other contact forms where you have to be dealing with some HTML stuff. As it doesn’t include any HTML coding whatsoever, clients really love it and prefer using it even for a contact forms which can be built without a pro version. Formidable Pro Supports almost all kind of fields that you can think of in your form. 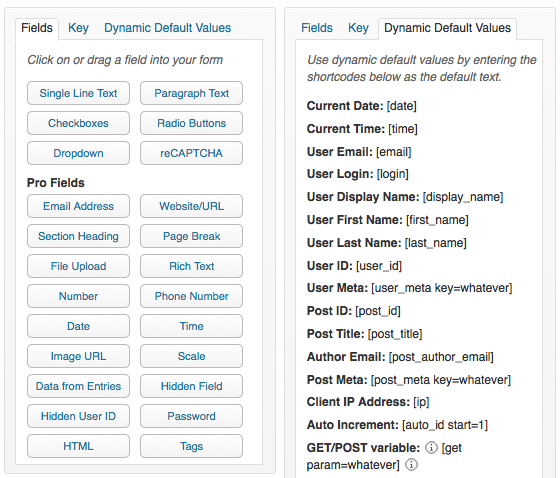 On top of that you have lot of values that you can pre-populate using shortcodes for those fields. You can see that even without pro fields, you can create forms with text fields, radio buttons, check boxes drop downs, along with reCaptcha where as in Contact Form 7, if you want to be adding reCaptcha, you need to install an extra plugin and then add the needed code for the reCaptcha to your form. Needless to say that adding your form to posts or page is as simple as adding a short code. On top of that each field type has lot of options for you to customize it. Beside that each fields has conditional statements which helps make that particular field show up if user has selected certain values in some other fields in the form. Something like if user selects the country as US, it shows the states fields else it does not. There are plugins to add more to your formidable forms. Plugins that can create a post in WordPress from user submitted content or register a user in WordPress or PayPal payment integration. Easily customizable form elements with global styling options for forms. This means all your form will look the same. So if you change in the form button styling, it will reflect the same in entire site’s form button. This is good but it would be great if we can customize each form style as well. Forms global look is fine but then at times you may need some of your form to stand out and though this can be done using CSS, a built in option can always help. What I Don’t Like in Formidable Pro? Everything is not always great about any product and as you use them, you realize that there is scope for improvements and so I will share issues that I have faced when using formidable pro. If you have a large form with lot of fields, you want to be splitting them into a progress bar kind of things. An example could be a typical survey form. 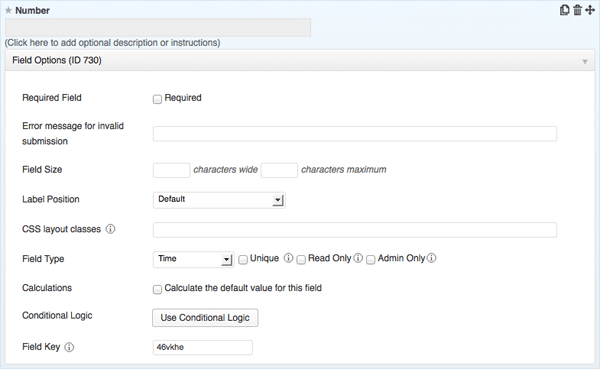 You can get that done in formidable using page break field but then with page break if user moves to the next step, the previous fields cannot be edited. So if you have 3-step form and if you are in step 2, you can move to step 3 but cannot go back to step 1 and edit some of those fields. 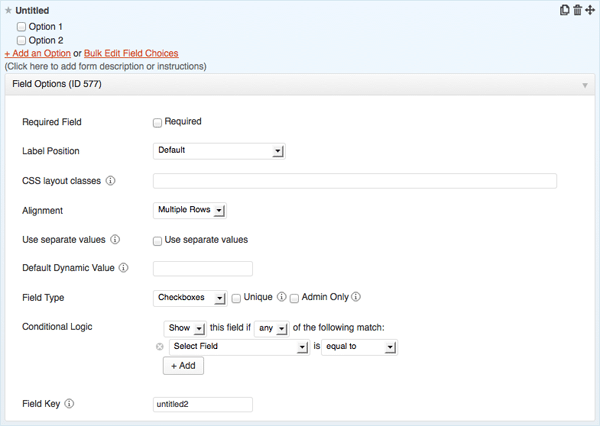 Unidirectional works great for survey because you don’t want users to be changing field value they have already entered but then for more conventional forms, you may want to allow your users to edit field values in previous step as well. Moving data between forms is not easy as it should be. If I have a form where users submit data and I want to be moving to next level in my forms, ideally I would prefer copying the current form into a new form and then build on the new form and then once I am done with the development of my new form, I should be able to export data from old form into new form but the export / import process does not import (or rather copy) attachments from old forms into new form and it actually links to the old attachment url. If I move to new form, still I have to be keeping my old forms for attachment purpose only. I think formidable pro is a great plugin for WordPress and I have deployed formidable to many of my clients WordPress site and I am yet to see any complaints. I have also developed some plugin into WordPress for my clients and they have good support documentation for plugin development as well as responsive to the queries. Seems like a good plugin for people in need of a customized form. But, imo, Jetpack’s form is enough for a normal blogger. To an extent for contact form, yes Jetpack would do but at times we need more than just a contact form.